Most people who walk through the front doors of the National Corvette Museum in Bowling Green, Kentucky are interested in seeing a few significant Corvettes from Chevrolet’s past, but a new exhibit will attract a different kind of enthusiast to the museum this summer. 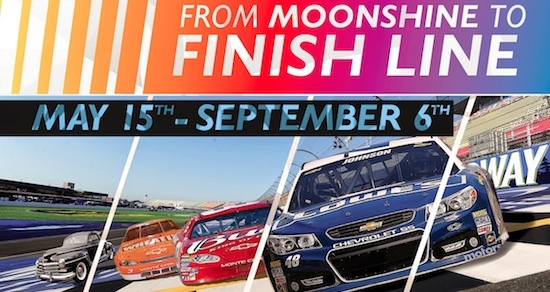 The National Corvette Museum has teamed up with NASCAR to bring Chevy fans the ‘Moonshine to Finish Line’ exhibit to their exhibition hall from May 15 through to September 6. The name, of course, is a reference to NASCAR’s early beginnings, when ‘shine runners would drive bootleg whiskey and alcohol through the Appalachian region as they attempted to evade the police. Eventually they started racing their modified moonshine-running cars, and the National Association for Stock Car Auto Racing (NASCAR) was founded in 1948 by Bill France, Sr.
As the name suggests, the NASCAR themed exhibit at the Corvette Museum will feature cars from both the moonshine running era and examples of modern day tube-frame purpose built racecars. In total, 14 cars will be display, including Dale Earnhardt’s 1997 Wheaties Chevrolet Monte Carlo, Darrell Waltrip’s Tide 1987 Monte Carlo and Jeff Gordon’s DuPont Fire & Flames 2005 Monte Carlo. Follow this link for a complete list of all cars to be displayed at the Moonshine to Finish Line exhibit.